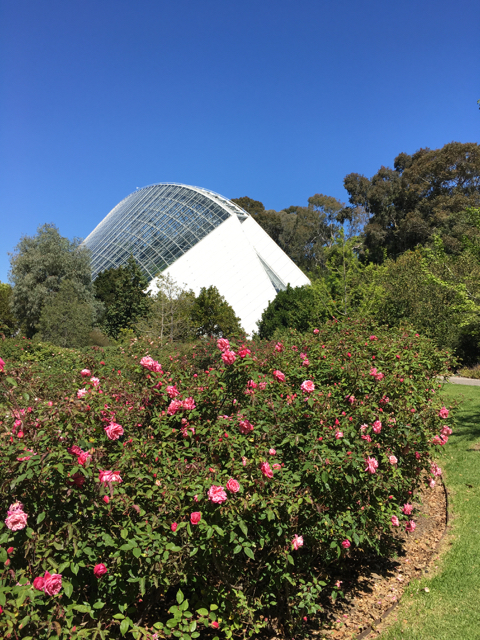 We love visiting the Adelaide Botanic Gardens every time we visit family in Adelaide. The gardens feature 50 hectares of magnificently maintained gardens and stunning architecture. 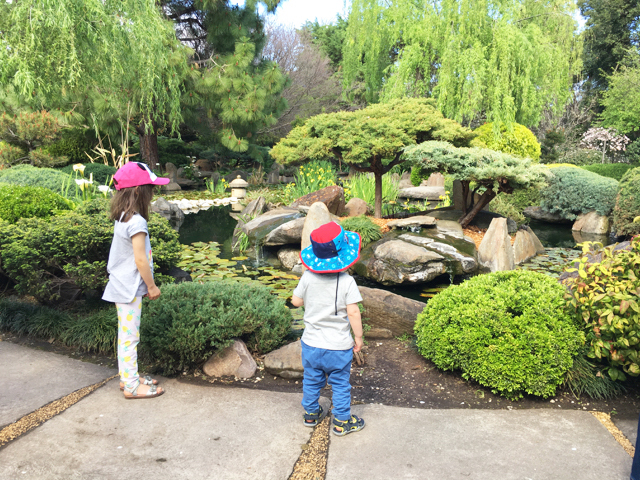 It’s always a treat with our little ones to walk around the gardens. The garden features a variety of gardens and buildings, so make sure you grab a map at either entrance. 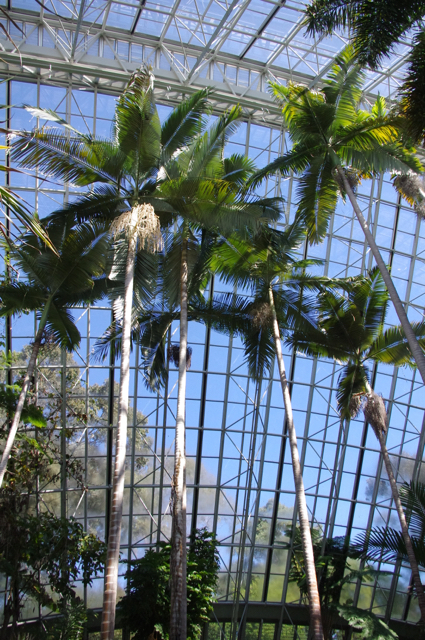 We walked through the Bicentennial Conservatory which was built in 1989 and is the largest single span glasshouse in the Southern Hemisphere. Home to a number of endangered rainforest plans from subtropical and temperate forests in Eastern Australia and abroad, it is a nice space to walk through and look up and observe. The International Rose Garden is a delight stroll among thousands of species of roses. Flowering in Spring and Autumn, the International Rose Garden and National Rose Trial Garden display over 5,000 roses including areas devoted to Australian-bred roses, single roses, heritage roses and pillar roses. To no surprise, the kids loved the Little Sprouts Kitchen Garden. This cute kitchen garden was designed as an educational space for children and includes garden beds abundant with seasonal fruit, vegetables & herbs, pots & trays, structures for climbing plants, fruit trees, compost, worms, working bench space and enclosed areas for group discussion and storytelling. It is regularly used by school groups. The First Creek Wetland nearby is a calming spot for visitors. On top of being a sustainable water supply for the garden, the wetlands are beautiful, essential and useful for maintaining a healthy environment for the garden. You might be lucky to see wildlife in the wetlands during your visit. The kids loved the cute water chickens! The 1877 built Palm House features a fascinating collection of plants from the ancient island of Madagascar and is one of the last of its kind remaining in the world. A great building to admire. The Amazon Waterlily Pavilion was based on the leaf structure of the Amazon Waterlily and the original 1868-built pond is still the central feature and home of the beautiful and exotic flower. We also visited the Santos Museum of Economic Botany which was completed in 1881 with a classical Greek-style exterior and features high ceilings, ornate Victorian details and historic cabinet displays. The kids loved looking through the Fruit model showcase, Fungi model showcase, grove and exhibition space. Last but not least, the SA Water Mediterranean Garden is a cute water play area for little ones which shows clever strategies of water wise plants from the five mediterranean zones of the world. The garden highlights how careful plant selection and thoughtful garden designs can be used to create stunning garden displays that use water wisely and well. 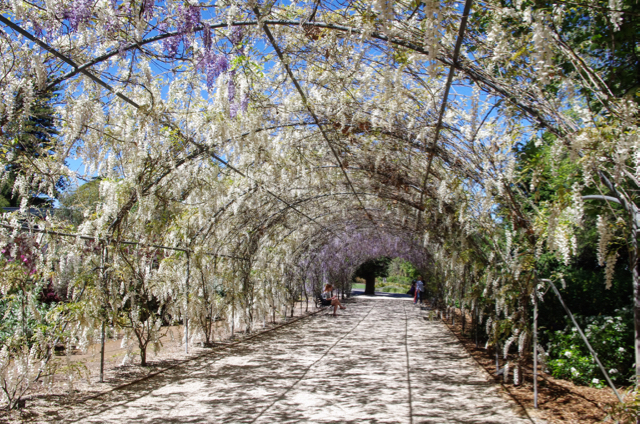 Do visit the Adelaide Botanic Gardens next time you’re in Adelaide, the whole family will enjoy it! The Adelaide Botanic Gardens is located on North Terrace in the Adelaide CBD. Entrances are from North Terrace, Plane Tree Drive, Hackney Road and Frome Road. 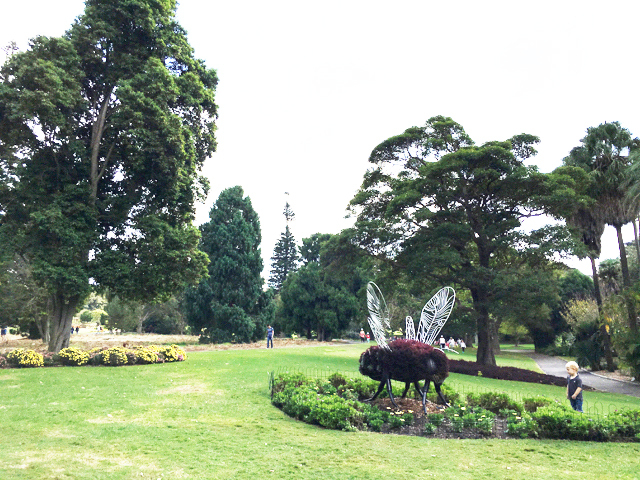 The Gardens is open 7:15 am weekdays and weekends & public holidays at 9am. Closing times vary each month of the year so check the website. The Gardens is pram and wheelchair friendly. There is parking at various parts around the Adelaide Botanic Gardens. There are toilets around the Gardens, grab a map at one of the entrances. 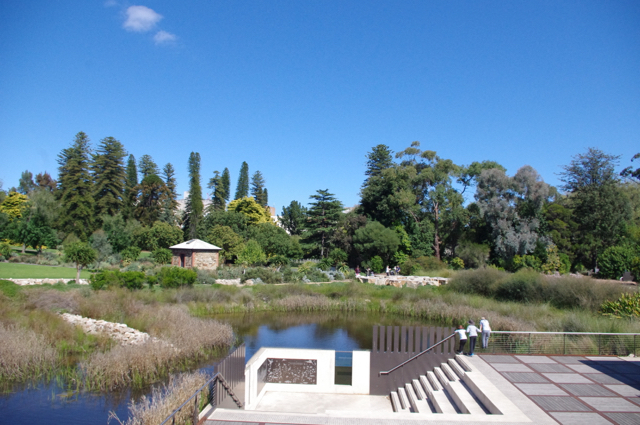 For more information and up-to-date news about the Adelaide Botanic Gardens, head to their website. A few weeks ago, Kate and her little ones visited Julian Opie: Studio for Kids at the National Gallery of Victoria (NGV). They enjoyed Julian’s individual style in both the main exhibition and the kids installation. If you’re in town, do checkout this great artist and have fun in the kids installation. Julian Opie, one of Britain’s leading contemporary artists has been making portraits since the 1990s. Julian’s bold style sometimes has him reducing people he sees into simple shapes. In his main exhibition self titled Julian Opie which is currently at the National Gallery of Victoria (NGV), Julian created a wide range of subjects specifically for the NGV spaces. In the central gallery, more than forty of the artist’s moving image works from 1993 to the present are on display. People are a key focus throughout the exhibition and Opie’s most recent works feature portraits and walking figures drawn straight from the streets of Melbourne. He also setup a city of skyscrapers which is currently taking over Federation Court from the floor to the glass roof. You will also see carps swimming behind the waterfall facade; some stone sheep grazing in the gardens and a crowd of sculptures of people walking have been placed in the lobby. 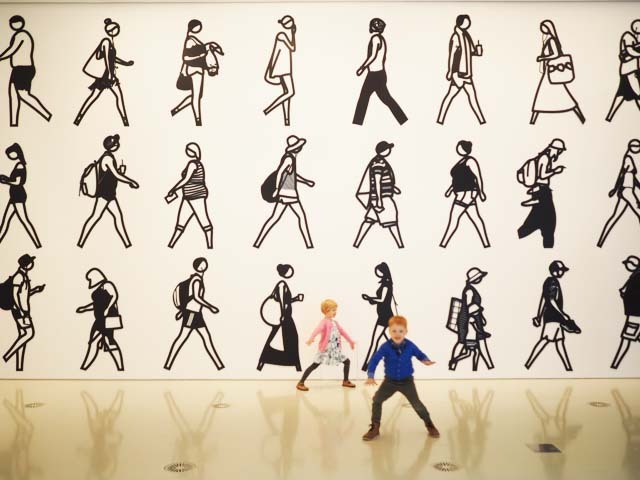 The Julian Opie: Studio for Kids also at the National Gallery of Victoria (NGV), presents an interactive exhibition for families, featuring hands-on and digital activities developed by the NGV and the artist. In this studio, Julian Opie invites children (and adults) to create a portrait in a new way. Kids can try constructing a portrait using felt shapes or create a digital self-portrait using only line and colour. Heads - The felt activity shows how just a few basic elements can come together to make a portrait. Children can also play with shape and colour to create a portrait using colourful felt pieces. Julian Opie + Me - This digital activity is inspired by Julian’s earliest work and how he used to look at himself in the mirror when he first started to draw portraits. He used to close one eye and carefully trace his reflection using a felt tip pen. Inspired by Julian’s approach, the digital setup guides children step-by-step to create their own colourful portrait in the style of the artist. Finished portraits can be shared on social media for friends and family to enjoy. 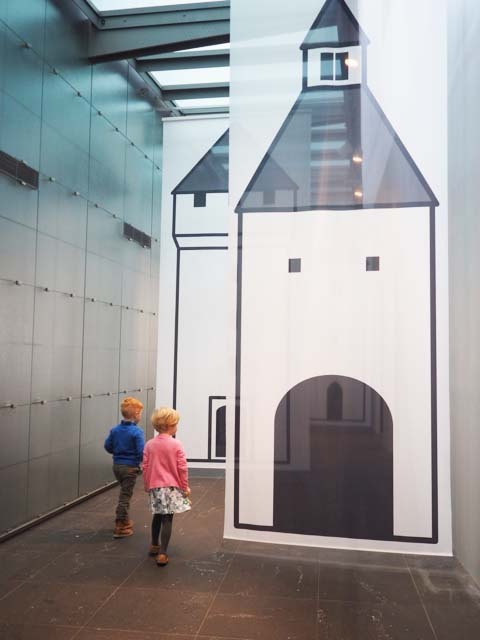 Kids will also see portraits by Julian Opie around the installation which might inspire them to create their own. For more information about Julian Opie, checkout their website. For more information about Julian Opie Studio for Kids, checkout their website. Busy City Kids were invited at the media preview of Julian Opie and Julian Opie: Studio for Kids for the purpose of a review. Both the main exhibition and kids installation are FREE entry. All opinions & feedback are genuine & truthful. Travel and food were self funded. Pop into The Studio for Sunnyside Up! by local artist Lauren Simeoni and discover that yellow really isn’t very mellow. It’s shiny, full of energy, light and positivity. Discarded pieces of various materials can be reborn as wonderful wearables. Kids can choose their preferred materials and make their own wearable, a piece of art, a sculpture or anything they like really. Their work can then be exhibited in the collaborative display cabinet or they can take their piece home. Little Miss and Little Mister really enjoyed Sunnyside Up! at the Studio, we were there for closer to two hours and created an array of things and even little Miss' grandmother made a few creatives too! Sunnyside Up! is open at the Art Gallery of SA daily 10am to 5pm from now until Sunday 2nd of September 2018. Admission to the Studio is FREE. Admission to the Art Gallery of SA is FREE except for ticketed exhibitions and events. The gallery is kid and pram friendly with toilets located around the gallery. For more information and up-to-date news about Sunnyside Up! or Lauren Simeoni, head to the Art Gallery of SA website. Some Museums get better with age! I may have had work drinks at the South Australian Museum back in the 2000's looking at the taxidermied animals gallery, some of which are probably still at the Museum today but one thing is for sure - we love Museums in our family. I grew up going to Museums and Galleries in Paris with my dad every weekend and I wouldn't have it any other way with my kids. The best thing is, most Museums are free to visit and if they're not, entry or membership fee pays itself in knowledge! We loved visiting the South Australian Museum on our last trip to Adelaide. The World Mammals Gallery, the Discovery Centre, the Fossils Gallery, the Ancient Egypt Gallery, the South Australian biodiversity and Whales & Dolphins are sure to keep your little ones busy and that's not all of the Museum and the best bit is general entry is free! The South Australian Museum's Discovery Centre is a wonderful thing. 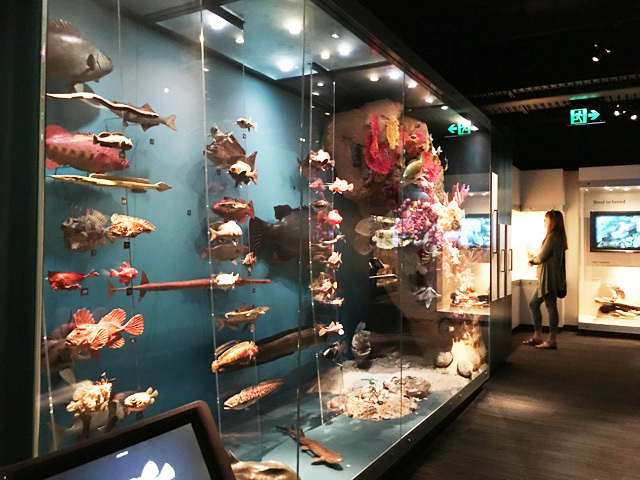 Located on level 1 of the Museum, it is a place of wonder where many species are exhibited. Children can also see an impressive working beehive, live scorpions, stick insects and more! Visitors at the Discovery Centre can get pretty hands-on (aka my kids - touch everything in sight ha!) and touch real fossils, minerals, rocks, animal skin and the like. Kids will love putting everything under the microscope and complete their own experiments. It was pretty impressive to watch the bees working away in the beehive, and watching them come in and out of the hive and going outside of the building. Kids can easily spend close to an hour exploring the Discovery Centre as there are an array of things to keep them busy with and keep them exploring around the room. My little ones' favourites are all the insects species throughout the centre hung up in beautiful frames and classified in draws. 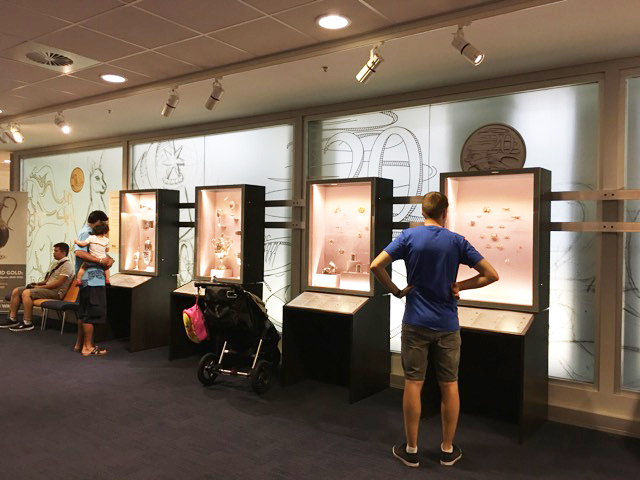 The Opal Fossils Gallery has a vast range of opalised fossils from Coober Pedy and Andamooka in the State's north to the largest ammonite ever found in Australia. Other galleries include the South Australian Biodiversity Gallery. More than 12,000 individual models were hand-made to create this gallery, along with historical taxidermy specimens from the Museum’s mammals and birds collections. 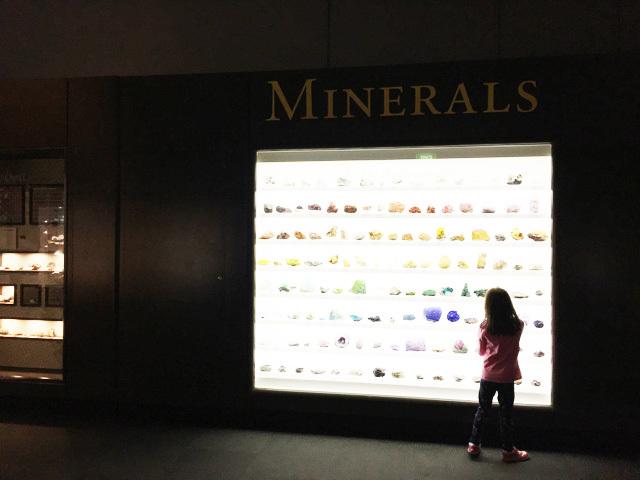 The Minerals and meteorites gallery has 35,000 specimens ranging in all sorts of stunning colours, shapes and sizes, some of which glow in the dark! The Ancien Egypt Gallery would have to be on of our favourite gallery rooms. Originally established in 1939, it gives an insight into the religion, burial practices and everyday life of Ancient Egypt. The room features some of the 650 artefacts from the museum's collection, most of which are genuine pieces from Ancient Egypt, with only a few replicas and model casts. While you're there don't miss Architeuthis dux, the 11 m long model of a giant squid which is a favourite among children. The display is in an old lift shaft and extends over four floors, complete with life-size models of other creatures that inhabit the murky depths. And if you didn't catch them on your way in, make sure you checkout the Whales and Dolphins skeletons at the front of the museum next to the café. The museum also has a Megafauna gallery with large animals including mammals, birds and reptiles. Don't miss the museum's Australian Aboriginal Cultures Gallery and Pacific Cultures Gallery as both galleries include large collections of artefacts. The South Australian Museum is a fantastic museum for local and interstate/overseas visitors to visit. 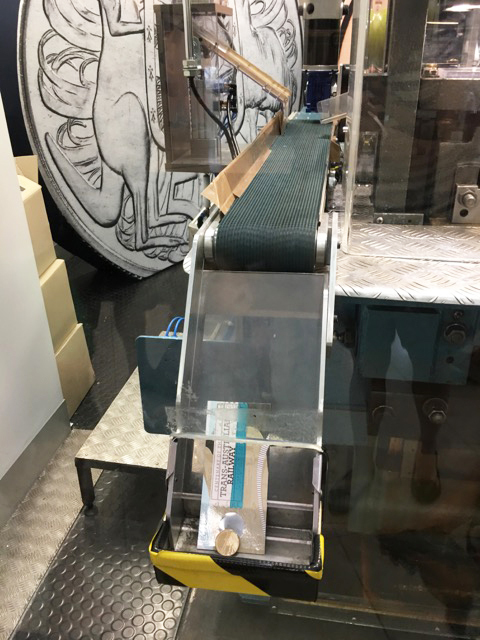 Allocate a minimum of 2 to 3 hours if you want to soak up most of the museum's collection and if your time is limited and make sure you visit the Discovery Centre. The South Australian Museum is located on North Terrace in the Adelaide CBD. The Museum is open daily except Good Friday and Christmas Day from 10am to 5pm. Anzac Day 12pm to 5pm. The Discovery Centre is open from 11am to 4pm weekdays and 11am to 3pm weekends and public holidays. It is closed from 25 December – 1 January. The Museum is pram friendly with lifts around the museum. Parking can be found across from the Museum or along the river and University of Adelaide. Be aware of current tram works extension. For more information and up-to-date events news about the South Australian Museum, head to their website. When New York comes to town, you come to town! Head to the National Gallery of Victoria (NGV) with the kids from now until October and experience New York! New York! 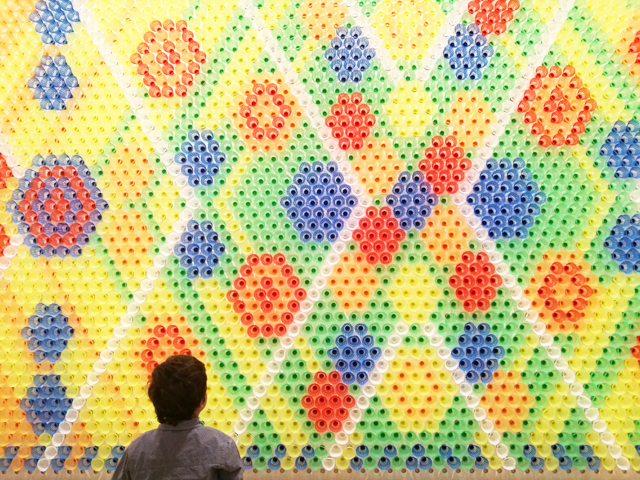 The kids installation coincides with this year's Winter Masterpiece exhibition MoMA at NGV: 130 Years of Modern and Contemporary Art (our review here) and showcases New York City – home of MoMA - Museum of Modern Art in New York. Kate and her little fun seekers headed to the media preview yesterday and loved wha the Big Apple had to offer! Thanks Kate for the gorgeous pics xo Catherine. Follow Kate on Instagram at @kateflatman. New York! New York! invites children of all ages (and adults) to explore the sights and sounds of the Big Apple - New York! 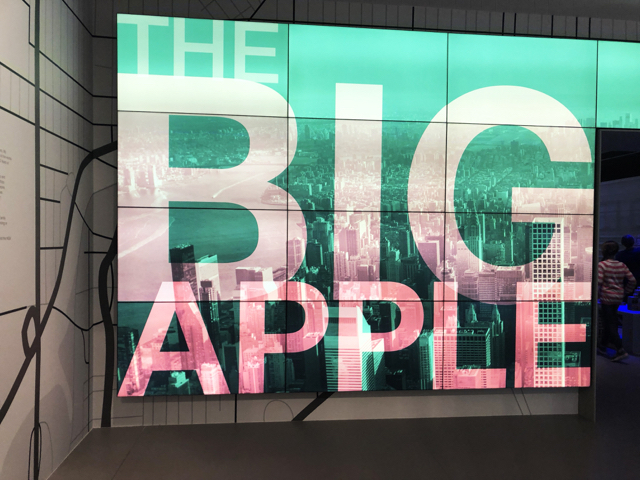 This modern installation comprises of four activity zones and a digital area where kids can take part in a quiz to test their knowledge and teach them about New York City landmarks. 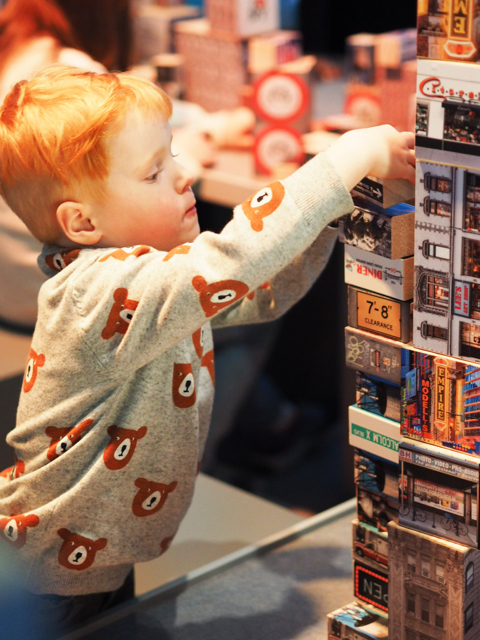 Two of the activity zones - City Blocks invite young children to discover Manhattan’s Uptown and Downtown and build their own miniature 3D versions of the districts using custom-designed wooden toy blocks that feature façades of New York buildings. One of the other activity zones is the Marble Run where kids can make a marble speed across the busy city and experience the hustle and bustle of the Big Apple. 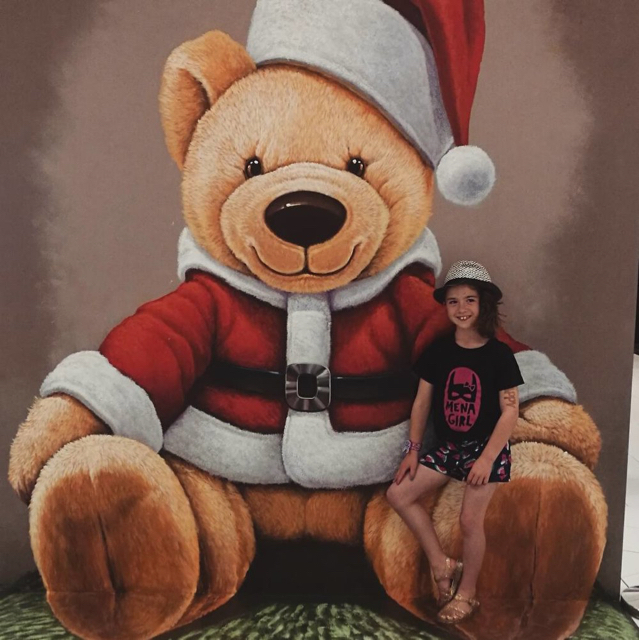 The last activity zone which kids will also love is the City Lights photo booth where you can pose in front of the iconic backdrop of New York’s city skyline. Kids can also test their knowledge about New York City landmarks in the digital installation Let’s Go to New York City! The exhibition also includes an immersive large-scale panoramic video projection of the New York City skyline with breakaway moments that highlight urban street life, underground subway networks, and the excitement of Broadway that kids will love watching. Kids will love New York! New York! - a great kids installation perfect for when you pop into the Melbourne CBD and perfect for the cold and rainy days this winter. New York! New York! is now showing at the National Gallery of Victoria (NGV) located at 180 St Kilda Road in Melbourne. The NGV is open daily from 10am to 5pm. Entry is free to New York! New York! New York! New York! is now showing at the NGV until Sunday 7th Oct 2018. The gallery is pram friendly however due to restricted space in the kids installation, you can park your pram in the pram parking bay and coats and drop any bulky belongings at the Cloak Room. Free city trams are available across the Melbourne CBD however make sure the stops you take are covered by the free program. 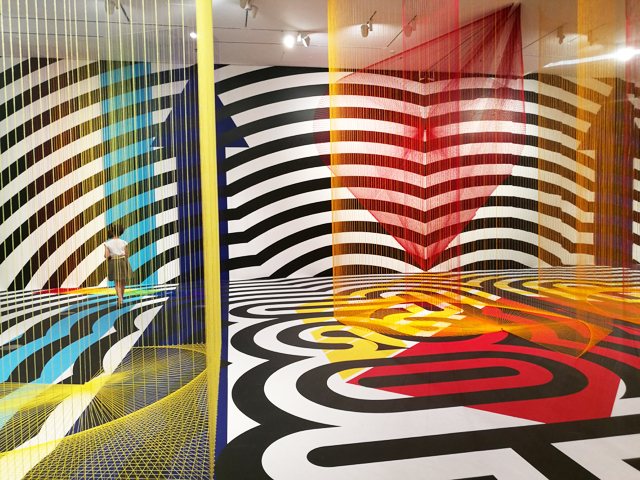 Checkout our review of MoMa at NGV: 130 Years of Modern and Contemporary Art here. For more information on New York! New York for Kids, head to the New York! website. For more information on MoMA at NGV: 130 Years of Modern and Contemporary Art, head to the MoMA specific website. Busy City Kids were invited to the media preview of New York! New York! for the purpose of a review. All opinions & feedback are genuine & truthful. Travel and food were self funded. We're heading to Adelaide soon and reminiscing on our visit late last year. One little gem we visited back in September was the Himeji Japanese Gardens located on South Terrace between Pulteney and Hutt Streets. Established in 1985 in celebration of Adelaide's sister city partnership with Himeji in Japan, the Himeji Gardens blend two classic styles: the ‘senzui’ style that displays the beauty of lakes and mountains, and the ‘kare senzui’ style that uses rocks to evoke the presence of water and oceans. This cute garden is a replica of a traditional styled Japanese garden. I say 'cute' because it is small and a quick visit however we did enjoy it! Such a peaceful setting, we found other visitors relaxing to the sounds and smells of the garden among the willows and the little stream. If your kids are anything like my wonderers, caution must be taken near the pond. When we visited, rangers were planting in the 'senzui' style garden and were resetting the 'kare senzui' style dry garden with the typical sand, rocks and moss. A very calming setting and we would have loved to be able to rake the sand away and reset our minds but we watched the rangers do it instead ha! We really enjoyed the tranquil and peaceful Himeji Japanese Gardens and highly recommend you pop in when you are visiting Adelaide. 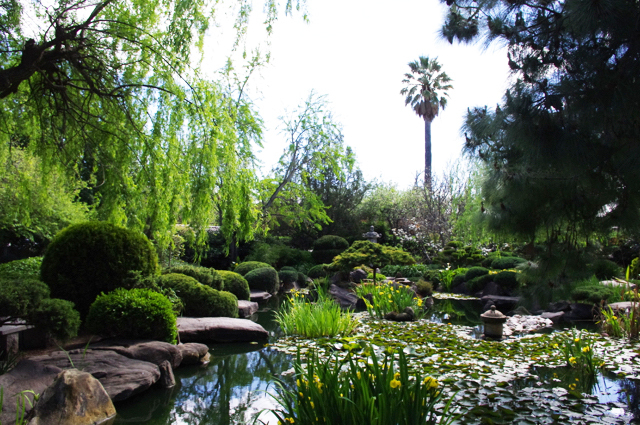 The Himeji Japanese Gardens is located between Pulteney and Hutt Street near Adelaide city. There is some free parking in front of the gardens. The gardens are open from 8am to 5.30pm, seven days a week except during April to September when it closes at 4.30pm on weekends and public holidays. Guided tours are available via bookings. 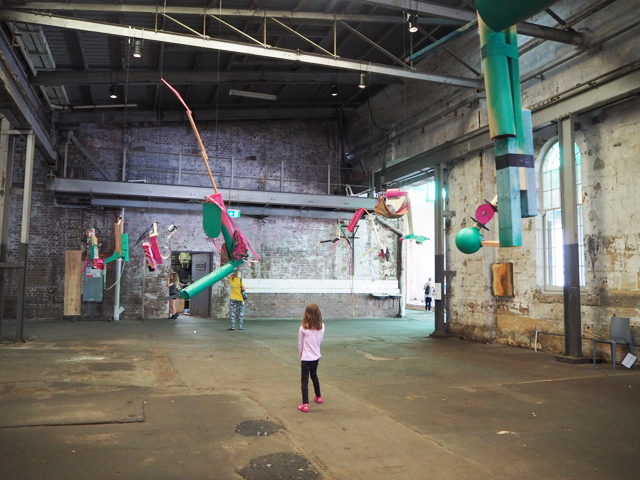 During the school holidays, little Miss and I visited Cockatoo Island for the first time to coincide with the Biennale of Sydney SUPERPOSITION: Equilibrium & Engagement exhibition. A few ferries later and we arrived on the island and first impression - we need to come back! I didn't even step into the beautiful old buildings and warehouses, I knew that it was going to be a place full of history and with the Biennale of Sydney and some kids art activities - even better! We made our way inside the main warehouse where most of the exhibits were installed and walked through the shipping containers by Yukinori Yanagi and explored the notion of human existence and looked at our reflection in the mirrors and looked down into our endless mirror reflection at the last space of the exhibit. We then walked towards Martin Walde's time piece where every six minutes a printed sheet of paper with a date on it flies down from an elevated printer giving visitors a concept of time and the passing of years. There are quite a few other exhibits on the island however we have chosen to highlight a few of our favourites. Of course, the pièce de résistance at the Biennale of Sydney for Cockatoo Island would have to be Ai Weiwei's piece on the refugee crisis in the world. I have personally loved Ai Weiwei's work since 2015 when he launched the Andy Warhol | Ai Weiwei exhibition and the Studio Cats installation for kids exhibitions at the NGV Melbourne. I was very inspired by his talk during the media preview as he has always been an artist and activist but only since 2014-2015 has he been allowed to leave China to continue his work because of the Chinese government and freedom of speech restrictions. Ai’s Law of the Journey creates an imposing statement. Featuring a 60-metre-long boat crowded with hundreds of anonymous refugee figures, the work brings the monumental scale of the humanitarian crisis sharply into focus and lets us reflect on human rights. Throughout our visit, I couldn't help but snap photos of the old buildings on Cockatoo Island. Now a UNESCO World Heritage Site, Cockatoo Island was once home to prisoners and convicts who were put to work there to build prison barracks, a military guardhouse, hand-carved granary silos, Fitzroy Dock and hundreds of boats before World War I. Learning about the history of this island would take another visit in my opinion as there is so much to learn however we did explore as we could on this visit. We took a break from wondering the exhibits to attend one of the school holiday art workshops run by Samantha Relihan where we added our many creations to the love message board setup while other children were taking part in building a Collaborative sculpture made from reusable products. 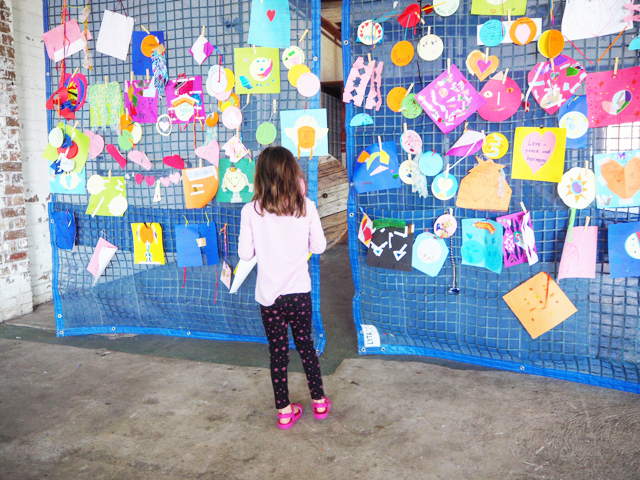 Join in the fun this Sunday 20th May from 11am to 4pm for Family Day at the Biennale of Sydney on Cockatoo Island. There will be talks, workshops, activities and performances. Head to this link for more info. After some time creating our own masterpieces, we headed back to the old warehouses to continue our art journey where we saw Mit Jai Inn's work which defies conventional boundaries both physically and conceptually. Mit’s artworks often appear as hybrid objects – paintings that could be sculptures, or sculptures that incorporate painted methods. This was by far little Miss' favourite installation as she loves paint and painting. Pieces from Tawatchai Puntusawasd fitted one of the old warehouse's space nicely. A Dim Night, a smaller companion piece (shown below) made from brass and nickel alloy allows the viewer to examine the sculpture in its entirety, manifesting the human striving towards knowledge. The sculpture is displayed alongside a new series of engravings on copper sheet documenting Puntusawasdi’s process. Little Miss was quite intrigued by Abraham Cruzvillegas' pieces and told me that she 'made some of these at preschool' - kids are so funny sometimes ha! I don't think her preschool work would compare to Cruzvillegas' pieces but it's cute! Cruzvillegas uses objects and repurposed materials and ensures he recognises the life and history inherent in each article. 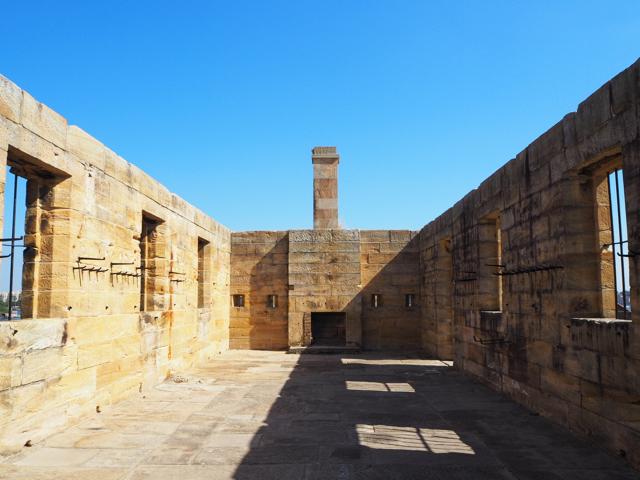 While exploring other Biennale of Sydney installations throughout Cockatoo Island, we stopped to admire some of the old buildings on the island including guards, prisoners quarters as well as the convict punishment cells. Cockatoo Island is a place rich in history and one which is great for families to visit throughout the year. We look forward to heading there during the warmer months and enjoy a wonder around the island and a picnic with friends. 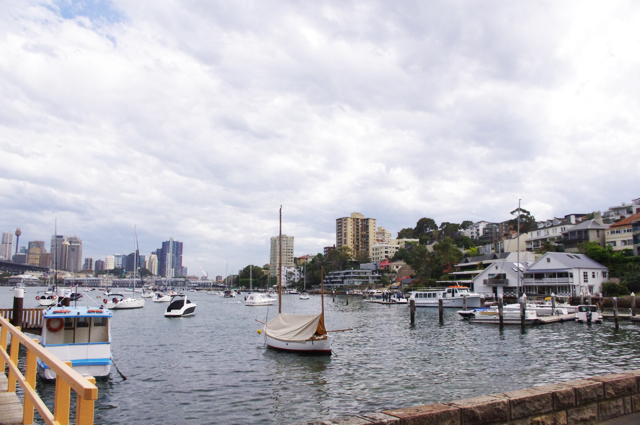 We really enjoyed our visit on the island for the Biennale of Sydney and highly recommend it. For more information on Cockatoo Island, head to their website. Biennale of Sydney - SUPERPOSITION: Equilibrium & Engagement is on now until the 11th June 2018. For more information, head to their website. 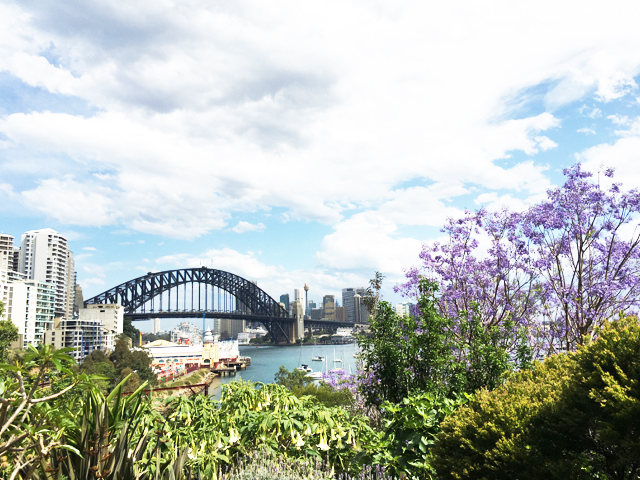 In September last year, we found Wendy's Secret Garden amongst the trees and overlooking the beautiful Lavender Bay, Luna Park, the Harbour Bridge, the beauty goes on! 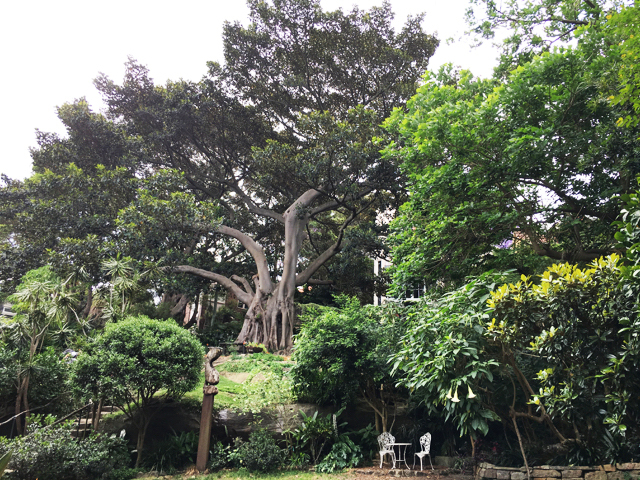 The history behind Wendy's Secret Garden goes back to when Wendy and her renowned artist husband, the late Brett Whiteley, set up their family home in Lavender Bay in 1970 and lived there together for two decades. Wendy's house overlooks the big fig tree and garden. Following Brett's death in 1992, Wendy needed to regain some control in her life and found herself cleaning up piles of overgrown rubbish on the large land filled valley of unused railway land at the foot of her house day after the next. As Wendy cleared the site, she began creating a garden like a giant painting. Rather than being horticulturally inspired, Wendy’s gardening was driven by aesthetics, colour, form, beauty and whimsy and successful transformed this large unused land into a beautiful and tranquil place for people to visit. After a Google find, we walked down Lavender Street, walked past Clark Park and found some steps amongst flowers and trees and made our way down. It's a cute trail for kids however be mindful some spots have steps and other spots are steep. Once we made our way down to the Garden's lower ground, we wandered about looking at the treasures and the beautiful flowers. Our favourite tree in Wendy's Secret Garden was the large fig tree, such a stunning tree! I can imagine that Wendy took inspiration for the garden from this beautiful tree. The view under the large fig tree is so stunning, we saw couples and friends sitting in different spots around the lower ground of the garden and under the beautiful fig tree. We then walked down the many steps to Lavender Day and did some more exploring and loved walking around the jetty looking for little sculptures and overlooking the stunning view. We finished our adventure walking past Wendy's beautiful secret garden and her beautiful house (cream colour house as can be seen on this photo). Wendy's Secret Garden is always open and free. To find the location of Wendy's Secret Garden or to find out more information about the garden, head to Wendy's Secret Garden's website. 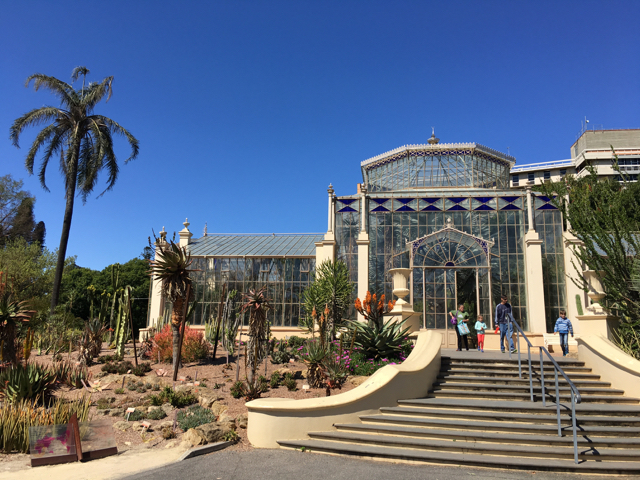 A few weeks ago, we visited the Royal Botanic Garden in Sydney after seeing a performance of Tinkerbell and the Dream Fairies. We love the gardens, it is a relaxing place to visit in the city, to wonder and to admire. It is located between the Sydney Opera and the State Library of NSW. Despite its size, It is easy to walk through the different sections of the garden like the Camellia Garden, the Herb Garden, the Oriental Garden and the Calyx our new favourite floral space. Pollination finished in August 2018. The Calyx will reopen on the 1st of October 2018 with a new installation: Plants with Bite. More info here. We have been wanting to visit The Calyx space at the Royal Botanic Garden ever since it was established, and especially the Pollination space. We hope to visit it again soon before it closes on the 15th of August 2018 for a new setup. Pollination is the current floral display at The Calyx and it is just gorgeous and a great place to bring the kids along too. Both my kids loved looking at the flowers, the giant bee and the small bees hanging from the ceiling. The wall features a collection of plants and flowers showcasing the role colour plays in nature's magnificent act of pollination. Garden beds of vibrant coloured orchids, daisies, gardenias and lilies are set against the backdrop of the display hero - the green wall. The wall, the largest of its kind in Australia, stands at 6 metres high and spans 50 metres. They also loved doing some puzzles and colouring in insects from the garden as well as taking a photo at the little photo booth. Tablets with pictures of flowers and insects were also available for kids to play with. The Calyx is a gorgeous place to take families and friends while exploring the Royal Botanic Garden but also a great place to have a coffee, high tea, take some photos and attend special events. Entry is free and donations are welcome. 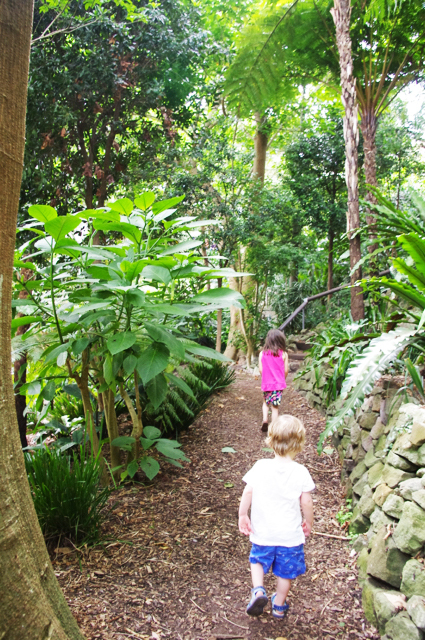 For more information on The Calyx at the Royal Botanic Garden Sydney, head to their website. At the end of December last year, we headed to Canberra for a few days. We love a Canberra visit as it's always relaxing, we can drive there, it's never too crowded and there is lots to do with kids and most of it is free! 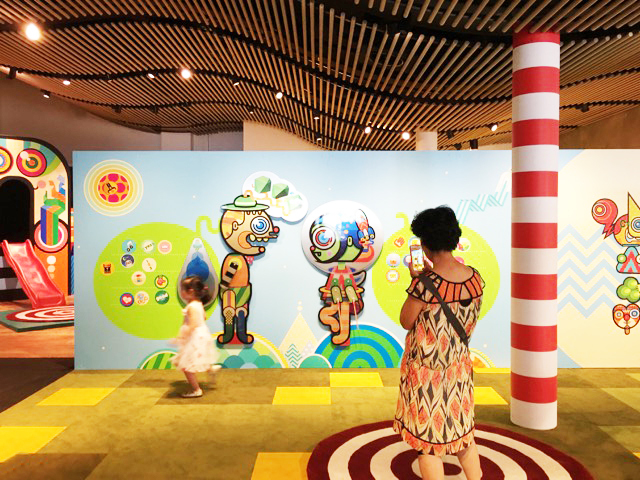 One of our favourite spots to visit when we do is the NGA (National Gallery of Australia) and we always make some time to explore the kids space - NGA Play. 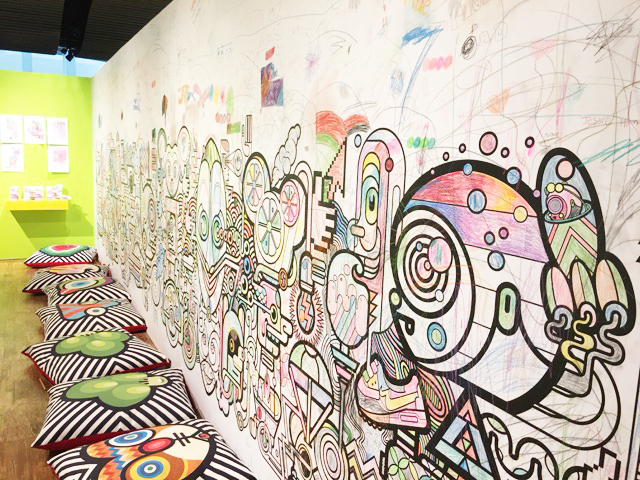 The latest kids installation at the NGA Play is from Indonesian duo Indieguerillas. This free installation takes visitors on a cultural journey through the stories of their home in Yogyakarta. Family and friends will be surrounded by colour and joy. Visitors can ride bikes to create sound and movement. Kids can colour in Indieguerillas' every so cool prints, take them home or put them up in the YEAH ROOM! They can also create their own digital avatar on provided iPads, our avatars looked quite interesting - ha! Kids can also play a fun bedroom tidying up game. Not surprising, little Miss wasn't interested, so as usual mummy had to tidy up! Indieguerillas' art is bright, colourful and kids love it! Mine loved the slide in the YEAH ROOM! A slide in a gallery - sure why not! The NGA Play is our favourite place to explore, learn and create in Canberra - always something fun to do! Kids can pin their colouring masterpieces, create their own shadow puppets and leave them as part of the display in the YEAH GALLERY. Kids can also colour the walls - yes you heard me write on walls! Or do a quite colouring in the YEAH ROOM, might be safer ha! Indieguerillas is on now until Sunday 13 May 2018 from 10.00am – 5.00pm daily - entry is free - enjoy! NGA Play is located near the main entrance as soon as you arrive at the NGA Gallery. The gallery is open 7 days a week from 10am to 5pm except Christmas Day. Entry to the NGA gallery, NGA Sculpture Park and the NGA Play is free except for special ticketed exhibitions. There is underground paid parking is available via Parkes Place off King Edward Terrace. There are café spots onsite. The center is pram friendly with a walking ramp and lifts. For more information, head to the NGA website. To read our other Canberra reviews including our review of the NGA Sculpture Park, head to this link. 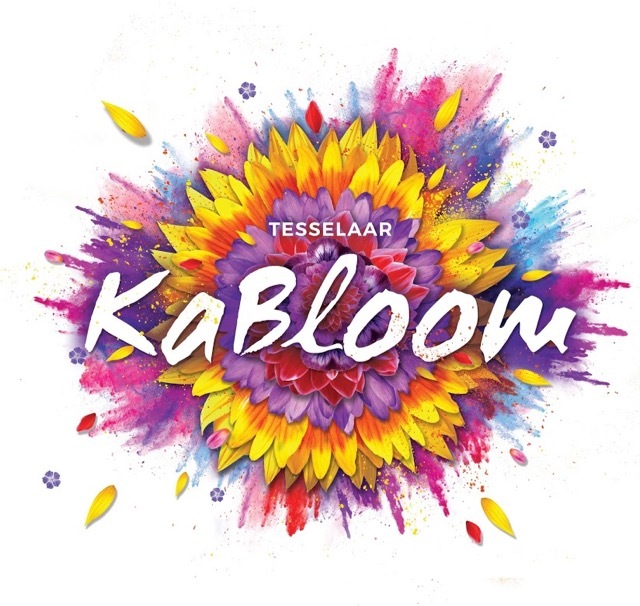 Celebrate the carnival of colour at Tesselaar’s new KaBloom - Festival of Flowers from March 30th to April 15th 2018. Held on Tesselaar’s flower farm in the magical Dandenong Ranges, KaBloom will be an explosion of colour in nature, with waves of over 1.2 million flowers in bloom across five acres of garden. Wow that's a lot of flowers for the kids to count - haha! Run over two weeks, the Family Fun Days (3-6 April and 9-13 April) kick off with daily shows from The Mik Maks, Bethany Fisher and Full Circle Drumming Workshops (first week) and The Kazoos, Trash Test Dummies and Ruccis Circus School (second week). Treasure hunts, petting zoo and giant garden games will keep the little ones entertained all day. KaBloom also brings colour to a new level during Colourific Weekend (14-15 April). Browse the annual Garden & Plant Expo and enjoy live entertainment from Fused and Bollywood dancers The Naach Box. If that’s too tame you can join in on our Colour War, but make sure you wear white for maximum impact! Live entertainment daily, delicious international and local food and children’s activities galore all contribute to this brand new carnival of colour. Photos below were taken last week - how beautiful are all those blooms! Open every day during the festival from 10am – 5pm, entry: adults $25, concession $22 and children under 16 free. Some activities require pre booking and additional costs like tractor rides and face painting. For more info or tickets, head to the KaBloom website. Looking for a fun activity to get the kids outdoors and active? 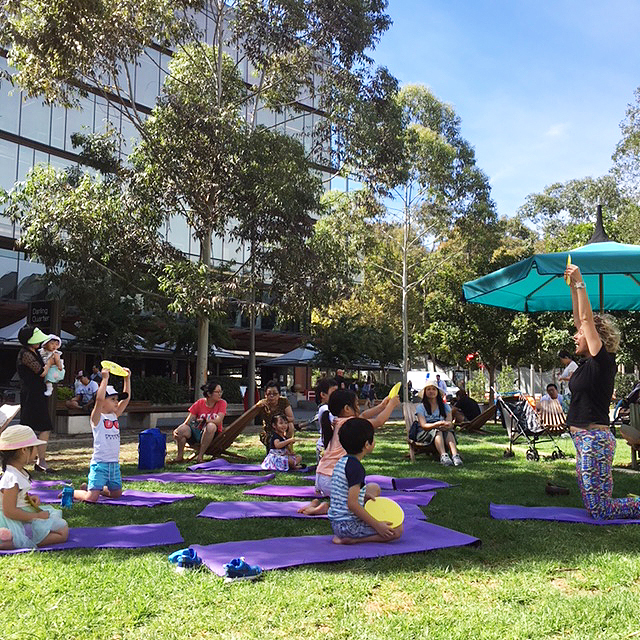 Then head down to the beautiful setting of the Darling Quarter’s Northern green on Friday mornings for a FREE half hour session of Kids Yoga. Designed for preschool aged children and their carers, the sessions are run by qualified yoga instructor Danielle (Dee Dee) Connor of Yoga Budz. 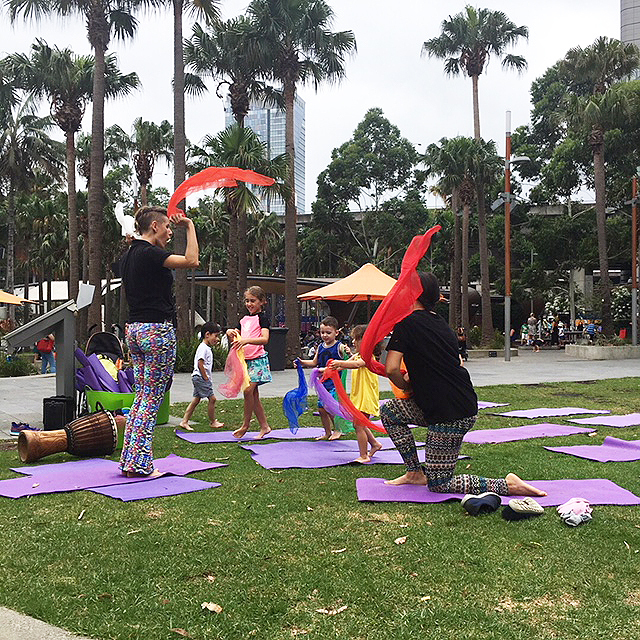 Dee Dee energetically introduces young children to various Yoga poses and movements in a fun and age appropriate way. Children’s Yoga is not only a great form of exercise and relaxation, but is also super cute to watch. Kids will love acting like animals, telling stories with their movements, and moving their bodies into a mix of serene and dynamic positions. There are 2 free half hour sessions running each Friday morning at 10:30am – 11:00am and 11:30am – 12:00pm. All mats are provided and no bookings are necessary. On days of poor weather sessions are held in the front foyer of Monkey Baa Theatre. For more information, head to The Darling Quarter website. Summer School Holidays are coming up in Sydney, here's our lineup of Activities and Events - let's do this! Alphabetical Sydney: Creative Lab at the Museum of Sydney. Immerse yourself in the alphabetical world of Alphabetical Sydney. Kids can explore the wonders of our beautiful city from A to Z. Read our review here. Arctic voices at Australian National Maritime Museum (ANMM) takes families on a fascinating journey to the Arctic in this new interactive exhibition opening on Thursday 14th of December. Be sure to checkout the various school holiday activities taking place too at the ANMM. Read our review here. Brickman Awesome at the ICC Sydney Convention and Exhibition Centre. Brickman Awesome will be made up of 38 never-seen-before LEGO® models, totalling more than 1.5 million bricks and clocking up more than 4,500 hours of build-time! It will also showcase the only life-sized LEGO® Harley Davidson ever made, the largest ever LEGO® Caterpillar 797 dump truck and a full-sized LEGO® Australian saltwater crocodile, weighing over 60kgs and built using more than 40,000 LEGO® bricks! Read our info post here. 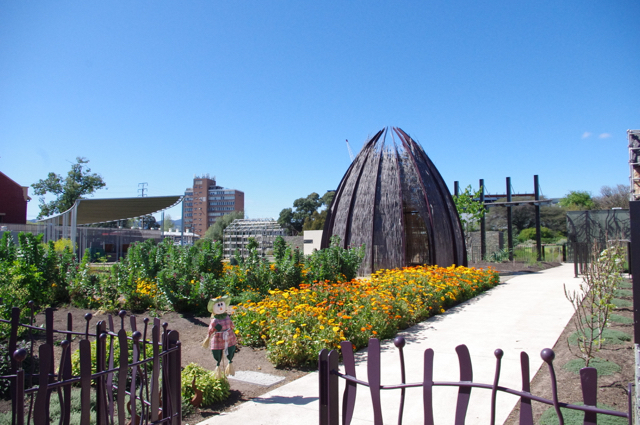 Ian Potter Children's WILD PLAY Garden at Centennial Parklands opened late October. 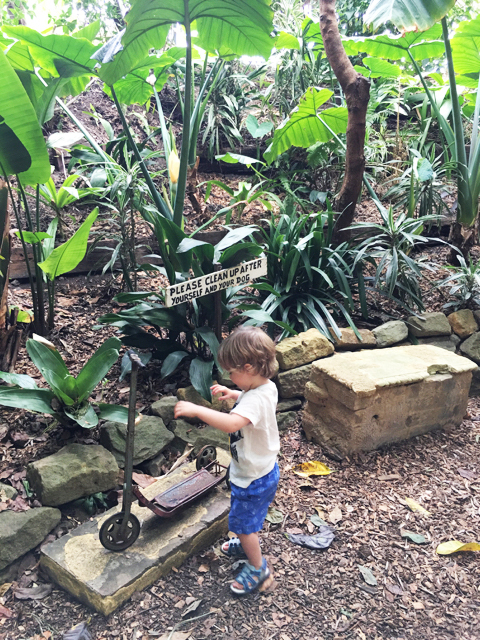 The garden is a special place for children and their families, a beautiful little oasis amongst Centennial Parklands with a beautiful garden, a treehouse with slide, bamboo forest, mounds and a water play area. Read our review here. Learn & Play! teamLab Future Park at Powerhouse Museum is the latest exhibition by Japanese art collective teamLab. Featuring eight interactive light installations never seen in Australia, Future Park is exclusive to the Powerhouse Museum. Read our info post here. Mammoths at Australian Museum. Rule out myths, learn new facts and get up close to the world's most intact 42,000 year old baby wooly mammoth! This interactive exhibition will have your little ones wrestling with mammoths, touch mammoth fur, tusks and walk past life size replicas of mammoths and so much more! 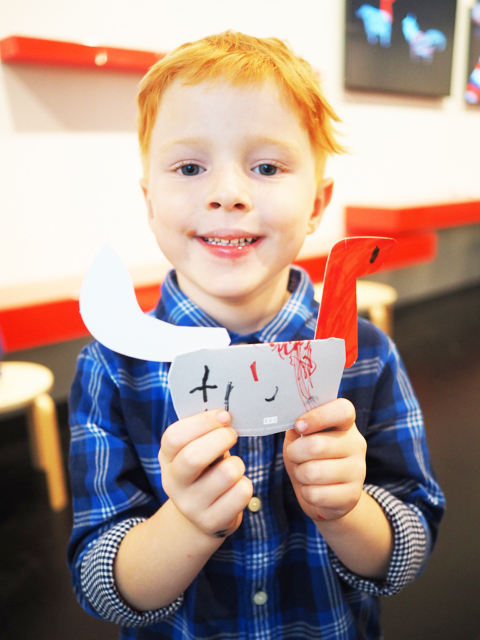 Checkout the awesome school holiday activities coming up at the Australian Museum too! Read our review here. Pipilotti Rist: Sip my Ocean at MCA. Pipilotti's vivid projections explore the relationship between nature, the body and technology and takes you outside of your comfort zone with rooms of hi fi projections. 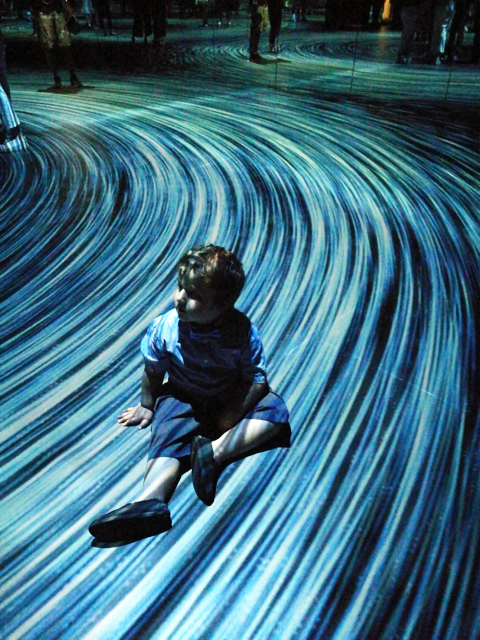 Lay down on beds to view projections, walk through the Instagrammable Pixel Forest and more. Read our review here. Tiger Trek at Taronga Zoo is a great experience to see critically endangered Sumatran Tigers face-to-face. Read our review here. Titanic The Exhibition at Moore Park. See the world’s largest and most comprehensive touring exhibition with 10 new exhibits including a Titanic VIRTUAL REALITY experience that lets you dive to the wreck, new artefacts and a new learning gallery! Must close in February. Read our info post here. Also checkout these great places in July ... entertain them for hours to avoid cabin fever! The Penguin Expedition at Sea Life Sydney Aquarium - Visitors are invited to see a colony of King and Gentoo Penguins up close onboard a little raft. It is the first of its kind and the experience is included in your entry ticket when you visit the Sea Life Sydney Aquarium. 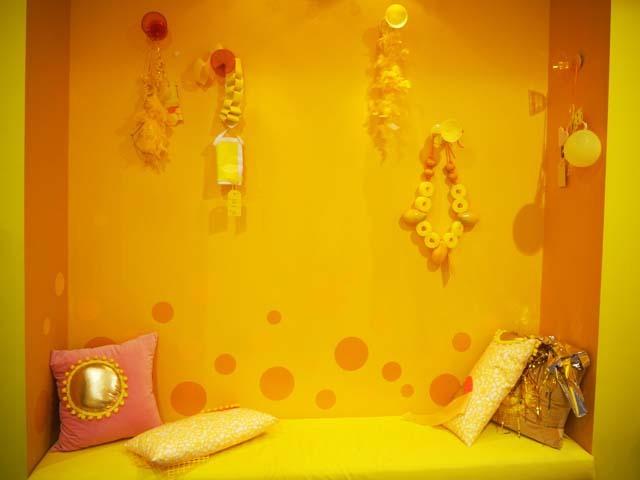 Wiggles Exhibition at Powerhouse Museum - A revamp of the old space, the Wiggles Exhibition is sure to entertain your little ones these holidays and it's here to stay and part of your Powerhouse ticket! Wiggles' favourite characters Dorothy the Dinosaur, Wags the Dog, Henry the Octopus and Captain Feathersword remain part of the exhibition however profiles of latest members Lachy, Emma and Simon along with some of their precious items and new interactive activities have been added to the new exhibition. Read our review here. 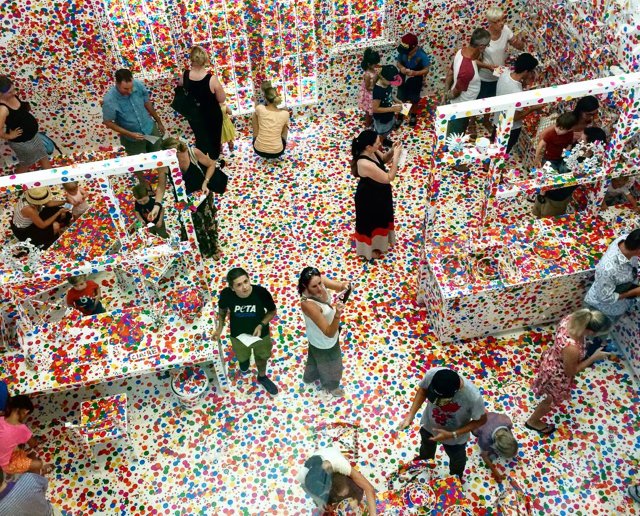 The Room of Lucky Charms at the Museum of Contemporary Art Australia (MCA). A NEW contemporary art installation featuring 600 soft sculptural good luck charms opened recently at the MCA and we love it! Room of Lucky Charms (2017) is a multi-sensory work created by Melbourne-based artist Kate Beynon for the sixth annual Bella Room Commission. Read more info here. 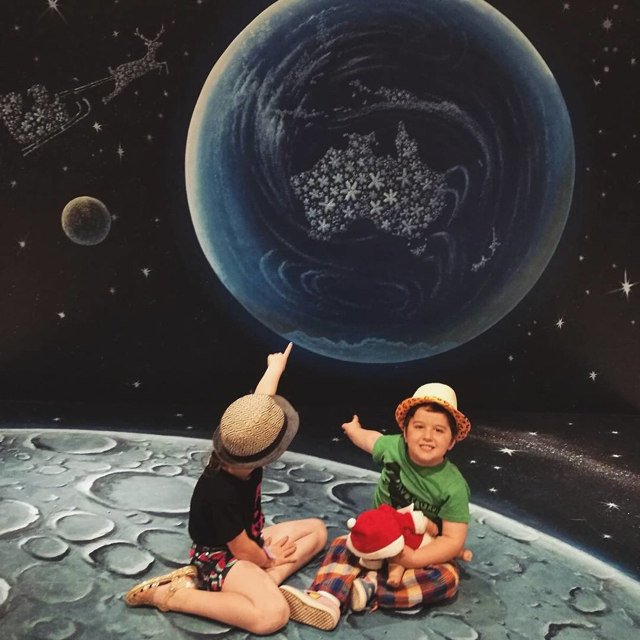 Our Top 5 things to do at the Australian Museum - The Australian Museum is always a great place for babies, toddlers, their parents and carers. There's always a new exhibition on that will tickle your little one's fancy, school holiday activities, free activities for under 5s during the week as well as weekday activities during term. Read Our top 5 permanent things to do at the Australian Museum here. Challenge your friends and family to a life size game of Monopoly…but with a twist. Traditional Monopoly locations such as Piccadilly and Mayfair, are replaced with iconic locations in the West including Williamstown Pier, Whitten Oval and Flemington Racecourse! Thank you to Kel from Melbourne Minor for these great pics and great video! @highpointofficial have just put in a GIANT Monopoly game for people to play! It's all been customised with west side attractions and it's free to play. You can pick up some cool instant win prizes while raising money for local charities. Book your time slot online now. Work your way around the board, test your knowledge of the west and try your luck at scoring your share in over $5,000 worth of prizes! FREE and on until Sunday 24th December. For more information and the skip the queue, head to Highpoint's dedicated website. There's nothing better than ArtVo than FREE Christmas ArtVo painted by the ArtVo Melbourne crew through the Crown complex! I remember it like it was yesterday when Kel and the Melbourne Minor gang popped into the ArtVo Melbourne exhibition to experience this fully interactive and selfie friendly exhibition. If you don't, checkout Kel's review of ArtVo here. The Melbourne Minor checked out the eight freshly hand painted new walls at Crown last weekend and suggested a brilliant idea! If you need a Christmas card photo then the Christmas ArtVo Pop Up has you covered! There is one wall by the epic Christmas Tree in the atrium and the rest are scattered around on level one, near the cinema. While you're there, visit the Crown Christmas Spectacular Show. The show runs on the half hour daily from 10am to midnight. It happens where the giant baubles are in the atrium. Thank you Kel for the fantastic pics and info! To follow Kel and the gang at Melbourne Minor, head to their Instagram page. For more information on Crown events and the Christmas Spectacular Show, head to their website. The inaugural NGV Triennial is coming this December at the National Gallery of Victoria (NGV). This free and exclusive unprecedented and large-scale exhibition of international art, design and architecture will open on Friday 15th December 2017. It will showcase major works by more than 100 artists and designers from 32 countries across all four levels of NGV International. Yep it's going to be BIG!! Traversing established, mid-career and emerging practitioners at the forefront of their fields, the NGV Triennial artists and designers have been selected for their diversity and dynamism of practice, including those embracing cutting edge technologies, from 3D printing to robotics, as well as performance, film, painting, drawing, installation and fashion design, tapestry and sculpture. 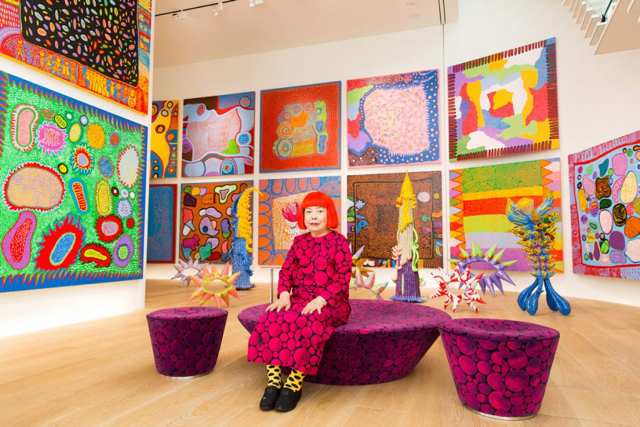 Highlights from the NGV Triennial will be a number of world-premiere NGV-led commissions, including a major new participatory work by Yayoi Kusama (Japan), in which kids and adults will ‘obliterate’ a room with flowers (oh my god yes!). A 15.8m long reclining Buddha sculpture adorned with 3D scanned and cast replicas of classical Greco-Roman sculptures by Xu Zhen (China), creating a meeting of Eastern and Western art traditions; an installation of elaborate, Marie Antoinette-inspired haute couture gowns from Chinese couturier Guo Pei; and a project by ‘smell designer’ Sissel Tolaas (Norway), in which she will recreate the scents of Melbourne. Wow! We are also very excited that teamLab will premiere a new interactive and fully immersive digital installation inspired by human, digital and spatial relationships and connections, commissioned by the NGV. Expressing these themes through the turbulent lens of the vortex, teamLab will transform a large gallery space into an enveloping environment of swirling illumination that responds as water would to human presence and movement. Sounds amazing! Reko Rennie’s commanding works exploring his Aboriginal identity through contemporary interdisciplinary media including painting, aerosol, collage and installation will also be on display at the NGV Triennial. We love him! Rennie will undertake two new large-scale site-specific works that intervene within the urban and architectural landscape of Melbourne; one at the famous flower clock on St Kilda road using his signature patterning expressed as landscape and the other in the interior of the NGV International. Wow! Brothers Fernando and Humberto Campana will exhibit Victoria Amazonica 2017 in collaboration with Yarrenyty Arltere Artists, the Centre for Appropriate Technology and Alice Springs based designer Elliat Rich. Drawing upon shared motifs from across cultures and geographies referencing waterways, the collaboration will present a vividly colorful upholstered dome, a meeting point and resting place to welcome visitors to the NGV Triennial. Presenting a snapshot of international contemporary art and design, the NGV Triennial will give voice to some of the pressing issues that are being explored by artists and designers today, including the social, cultural, scientific and physiological questions of our contemporary world.